6:00 PM - Doors open and voting begins! 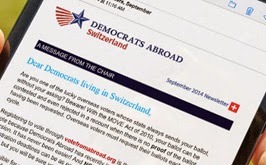 - Welcome and Global Primary overview by Maya Samara, Chair Democrats Abroad Switzerland. - Overview of priority national House and Senate races, and what’s happening in the presidential campaign by Caitlin Kraft Buchman, Democratic National Committee Member & former Chair of DA Switzerland. - Q&A session: members invited to comment and ask questions. - Support Democrats Abroad appeal from Marcus Courtney, DACH Treasurer. - Upcoming DA events and call for volunteers by Maya Samara. 9:00 PM - Voting ends … ballot counting begins. Results will be posted by midnight! Buy your Obama and Democrat merchandise too!